Anytime I look at this photo I always think how soft everything looks in it. It’s a wonderful side effect of infra-red, particularly on grassy areas, it almost makes it look like snow. Believe me it couldn’t be further from snow if I tried, this was in fact a beautiful summers day, this entire area just happened to be under the shade of the trees. I love stumbling upon this little used walkways through some of the thicker forested areas, I am sure there are plenty of other people who use them but I always get this feeling that I am the only one around, very pleasant indeed. I wasn’t sure at first about the two main trees in the shot, both look like they are falling over but I find you tend to lean your head whilst looking at the picture and I love watching people doing exactly the same thing as me when they view it. I find this quite a lonely almost cold feeling photograph but there is something about the trail of the pathway that always makes me wonder what is around that corner. 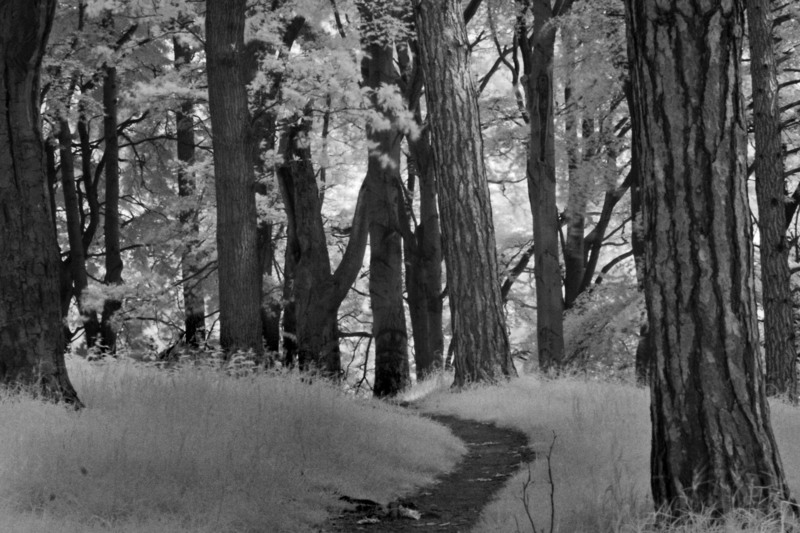 This entry was posted in Black and White Photography, Infra-red Photography, Irish Landscapes, Phoenix Park and tagged Black and White, Infra-red Photography, Phoenix Park, Photography, Tall Trees, Trees. Bookmark the permalink.